This past Monday, we began construction on our bathroom downstairs. Well, we hired someone to do it because it was more than just a little remodeling job. It needed to be completely finished including drainage in the shower and other bits that I can’t quite comprehend. Anyway, there has been much progress and it is really shaping up fast, which means we continue to have to make lots of Menards runs and Home Depot runs, and make a lot of decisions. After work yesterday, we headed to Menards for a laundry list of items needed including: Sink faucet, shower head, tile, etc. Also, it is coming up close to time to start painting the bathroom, which means I have a major decision to make. Although Dana can provide great input, the final decision comes down to my preference for paint color because I am more of the “interior decorator” of the two of us. He would admit this too. Although my skills seriously lack, but I do try and be creative. We have beige tiles and slightly darker tan tiles to cover the shower walls, shower floor, shower ceiling, and bathroom floor and we will have white baseboards. Since the bathroom is in the basement with no outdoor window, I didn’t want to choose a color that was too dark. 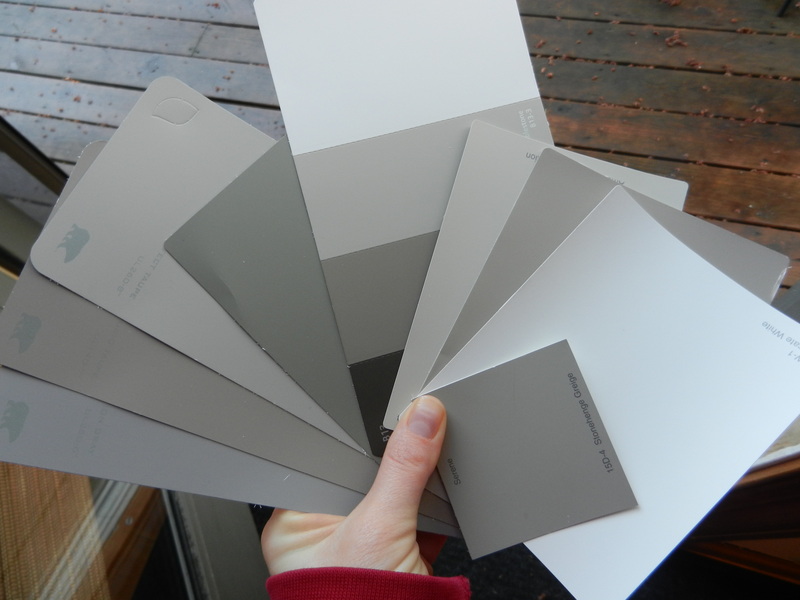 I am leaning towards the gray-tan family. I grabbed a bunch of samples and plan to take them downstairs once our worker bee is done for the day and make a final decision. I originally wanted to paint the bathroom red but considering we won’t be living in this home forever, my realtor/amazing dad suggested that we don’t paint it red because it is hard to paint over red. What if someone doesn’t like red? They would have a heck of a time getting rid of it! So, I decided I could do red accents instead. However, now that I am glancing around my home, I notice that a lot of my home, the living room, kitchen, and family room, all already have red accents. Maybe I should expand my color horizons. K, this ended up being a longer tangent than I was expecting so I apologize to anyone who fell asleep while reading that. It’s funny what else happened to hop into our cart at Menards. Who snagged the kid’s toy? 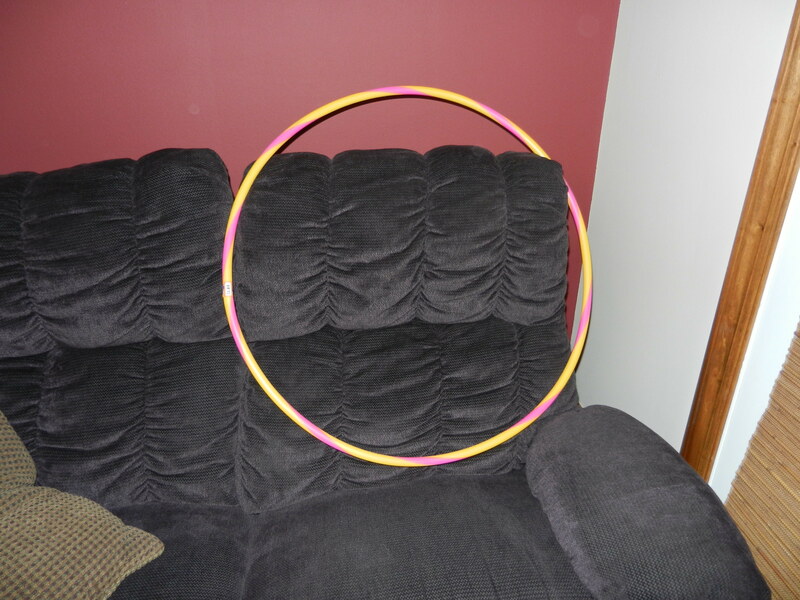 It wasn’t Dana, so I will give you one more guess as to who thought it would be a good idea to buy a hula hoop. Seriously though, how much fun are these things? They are a great workout too! I just need to keep Moose away while I do it because he inevitably sticks his face right into the hoop as I’m twirling. When I was at my internship in LaCrosse, WI, I helped teach a health course through the hospital which was geared towards patients with metabolic syndrome, which means that they have three or more of the following symptoms: high blood pressure, high fasting blood glucose, large waist circumference, and high triglycerides (there are guidelines for each of these symptoms). These symptoms are risk factors for heart disease, stroke and type 2 diabetes. The course was designed to teach heart healthy living. Part of the class was nutrition education, which I helped with, the other half focused on physical activity, and an exercise physiologist led that portion. We would go for a walk with the participants or head to the exercise room which was full of treadmills, ellipticals, bikes, weights, and my favorite was the weighted hula hoop. I don’t remember how much weight was on it but it was just a heavy hula hoop and it REALLY worked the core when in motion! I debated buying one but never did. I may have to rethink that idea. That was tangent #2 for the day. 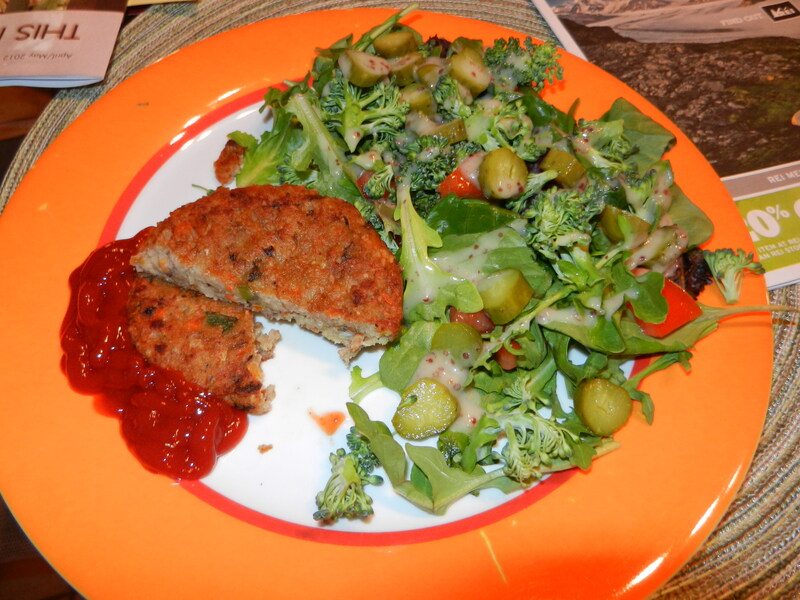 After running to Menards we got home and I cooked up a couple of Morningstar Garden Veggie Patties for a quick dinner. 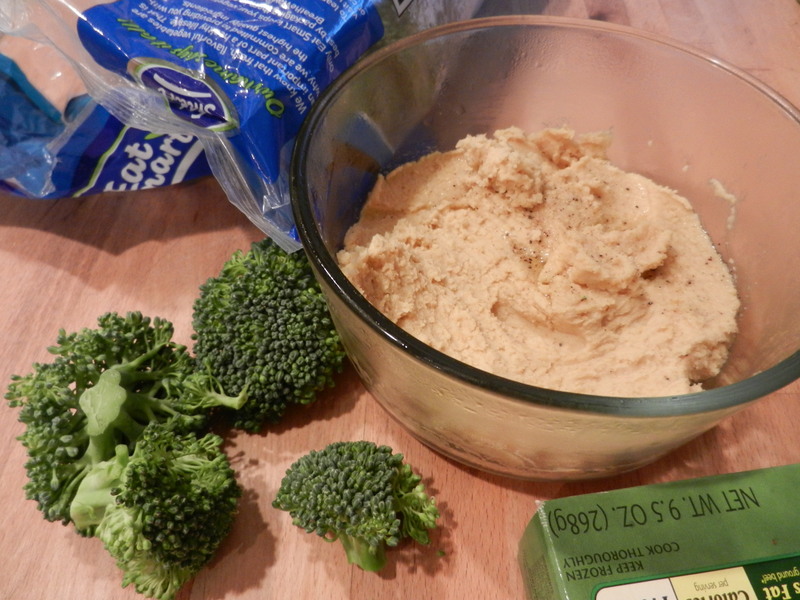 While I waited for the patties to cook, I snacked on some broccoli and homemade hummus. Once my patty was nice and crispy, I served it alongside a nice green salad complete with tomatoes, more broccoli, and a couple of baby pickles. Not pictured below was one Laughing Cow Light Swiss Wedge. After dinner we hit the road again. Back to Menards again because while we were finishing eating our bathroom guy told us we had to get the unsanded grout, not sanded. We had debated calling him when we were at Menards because we weren’t 100% sure but nah we’ll just get this sanded kind. Wrong. Who would have thought buying grout would be so difficult. Oh also, there are TONS of colors to choose from. Why can’t they make it easy for people like me who can’t make decisions easily and just have two colors. Seriously. So, back we went to Menards to get the right grout. Then, we needed to go to Home Depot to buy some end tiles for the shower. Oh, what’s that? They only have 11 tiles in stock and we need 19? Perfect. Well, let’s go to another Home Depot. We got back in the car and headed to another Home Depot and got the remaining 8 tiles. When we got in the car to go home it was already 8:15 and I was exhausted. Dana and I spent a lot of quality “windshield time” together last night, as he likes to call it. I snacked on some blackberries when we got home as well as some Multi Grain Cheerios Peanut Butter. Now it is Friday morning. I am sitting here on the couch trying to muster up energy to go run. I ate my pre-run breakfast, had a cup of coffee, and now need to go get into my workout gear so that I am more encouraged to go. 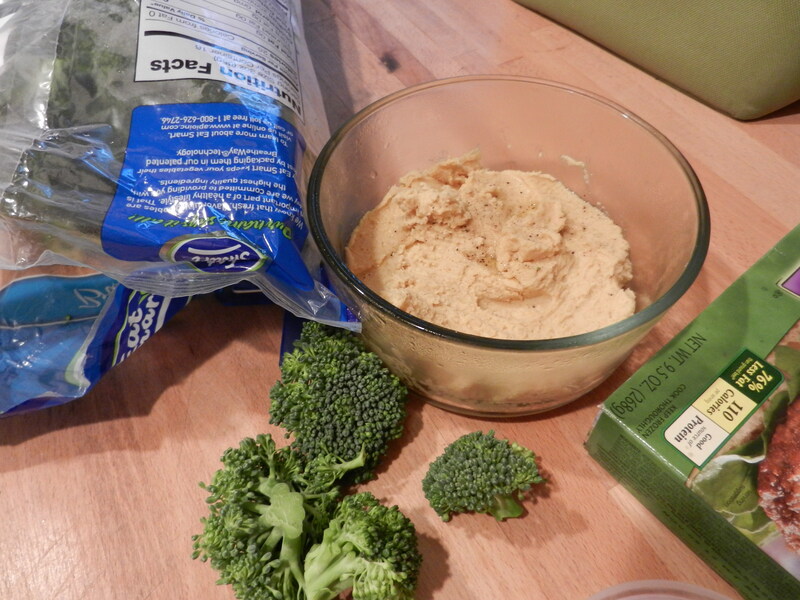 This entry was posted in Home Life, Misc. and tagged Laughing Cow, peanut butter by Melanie. Bookmark the permalink. My daughter has so many hula hoops in her room that I do not even know what to do with them =) She does not allow me to throw them away but they take so much space!